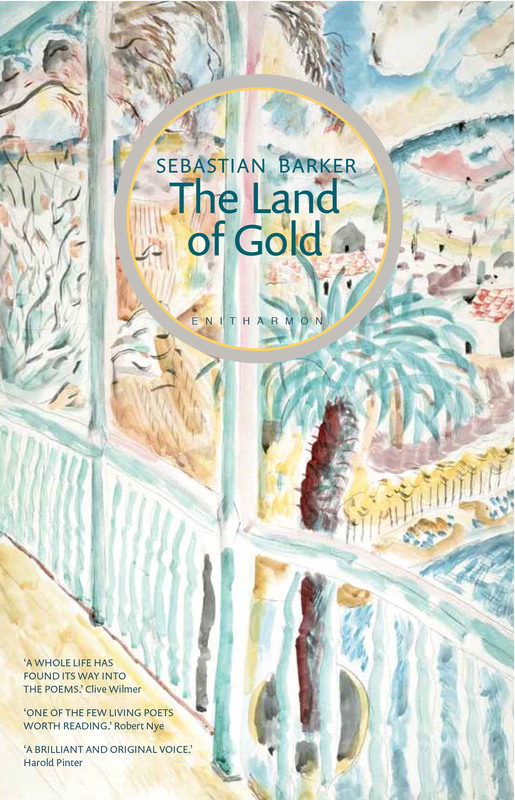 Sebastian Barker, The Land of Gold (Enitharmon Press, 2014). For the time comes, when going for a walk is a thing of the past. So writes Sebastian Barker in his poem ‘On the way to Kyparissia Beach and Back’, a journey where he notices everything, every little thing and appreciates it, nothing is too small or insignificant to escape his gaze and be commented on, noted, described, linked to other parts of this walk. He knows, one day, physically, he will not be able to make this journey at all, but there will be one final journey waiting for him. Barker was born in 1945, and died in 2014 at the age of 68, from a heart attack only a few days after an event to launch his latest collection, The Land of Gold. He was the author of fourteen volumes of poetry as well as three collections of philosophical, theological and cultural essays. He was Chairman of the Poetry Society between 1988 and 1992 and was a Hawthornden Fellow, a Royal Literary Fund Fellow, and a Fellow of the Royal Society of Literature, and as well as being a writer-in-residence, he was editor of The London Magazine from 2002 to 2008. Towards the end of his life, he was wheelchair bound and had been suffering from incurable lung cancer, the shadow of death trapped within his body and permeating his later work, but not completely, for while acknowledging that death was his constant companion, the poems collected in The Land of Gold are life-affirming, taking stock of what was all around him and giving thanks for it. And lamenting music by cutting off a foot. Plucks each word by the altar. In other poems he draws inspiration from everything around him, and regrets that they will continue, when he will not be here to appreciate them. Though he is far from being maudlin or sentimental, his poem ‘Skellig Michael’ about the fate of the monks on Iona when the Vikings land, ends with an impressive line that can induce an almost involuntary shudder in the reader, as if they are trying to ward off the dagger just about to be slipped between their shoulder blades. Many of his poems are song-like in construction, particularly ‘Scarlet Rose’, dedicated to the grand-daughter he never met, who died just before her birth. Simple and heartfelt and perhaps envious of the journey she has taken. Out of the darkness, look how she glows. Finally, ‘In Basho’s Hut’ with the wheel of a starry night overhead, and perhaps also with the liberation of some wine, Barker connects with the 17th century Japanese poet, Matsuo Basho and together they connect with God, two sailors separated by centuries but connected by the rivers of life and poetry. Wisdom, to show what wisdom is. The last part, a section nearly fifty pages long, could, for other poets, easily have formed a collection in its own right. This section is titled ‘A Monastery of Light’ or ‘The Sitochori Poems’ named after the village in south-west Peloponnese. Inspired by the Greek poets Barker bought a ruin there in 1983 for the princely sum of £780, a place which had been lying derelict for 60 years. Barker then restored it using the “old traditions” and with a lot of help from his neighbours to work on the stones, the beams, the tiles, the pipes and the wiring and he became intimately familiar with the house. He lived there on and off for the next 30 years and became increasingly influenced by the long lined poetry of the Greek poet Odysseus Elytis, a Nobel Prize winner. Yet although he may have been influenced by the past, he was also inspired by the spirit, his own and others – the spirit of those who dwelled in his house before him and the spirits that infused the surroundings in this ancient land, a gift from the gods channelling through him and on to the page, a gift that could not be refused or denied, when the spirit called, you had to answer or the moment was lost. This section is an extended love poem to this village, its way of life and its surroundings. First is the poem ‘Sitochori’ comprising of 14 parts spread over 12 pages when the story of the house restoration merges with everything and everybody, the season, life and death, the locals, their traditions, history and myth and legend, all of it is here in these 12 pages. This is then followed by poems on such simple subjects as walks to the beach and back, and what lies in between, or walks on tracks through the orchards, looking out over stunning, wavering sea views and graveyards, but more importantly, the miracle of leading such a life, being allowed to lead such a life, even latterly in the shadow of death, then there is no more for Barker and from Barker, not in this life, because he has moved on, sailing on a boat of light, out of the darkness. This becomes more obvious, the closer you are to death.